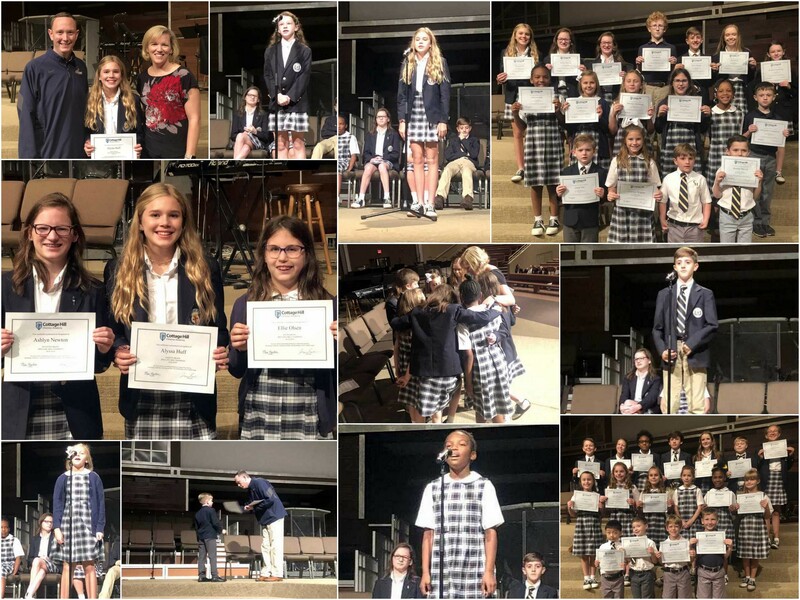 Cottage Hill Christian Academy’s annual spelling bee was held in the Worship Center of Cottage Hill Baptist Church on Wednesday, October 10, 2018. Students from each 1st-8th grade class were recognized for their spelling achievements. Representatives from grades 4-8 competed for the title of "Bee Winner". Alyssa Huff won with the battle of words with the word “cohesive”. Ashlyn Newton and Ellie Olsen tied for runner-up. Alyssa will represent CHCA in the Mobile County bee in February. Cottage Hill will also participate in the AISA competition. Our top finishers from each grade will go on to the district bee against students in their grade-level. These students are: 4th grade– Camile Elvis; 5th grade– Ellie Olsen; 6th grade– Riley Chason; 7th grade– Ashlyn Newton; 8th grade–Alyssa Huff. Congratulations Spelling Warriors!